The ongoing restructuring of the economy continued to take its toll on the job market last year, displacing more workers, particularly higher-skilled ones who suffered the brunt of the damage. Observers said that measures such as the Fair Consideration Framework to reduce the reliance on foreign labour may explain partly the rise in redundancies. More non-residents lost their jobs last year while fewer Singapore citizens and permanent residents did, compared with 2013. "Foreign manpower tightening in the past few years is essentially to encourage companies to cut headcount," said DBS Bank economist Irvin Seah. While more workers were displaced, nearly seven in 10 residents who lost their jobs in the first nine months of the year managed to find a new one by December. But PMETs and degree-holders lagged behind. Their rates of re-entry into employment were only 63 per cent and 61 per cent respectively. The job re-entry rate of the degree holders slipped from the previous year, while all other educational groups saw improvements, "reflecting the strong competition for jobs among degree holders", said MOM. Companies in the sector let go of more workers last year, and listed business restructuring for greater work efficiency as the top reason for letting their staff go. But a bright spot is that the number of layoffs in the manufacturing sector fell by over 20 per cent, from 5,000 in 2013 to 3,970 last year. Experts noted that PMETs' higher share of redundancies could be explained partly by the fact that they make up about 53 per cent of the resident workforce. "The numbers tally with the profile of the workforce, which shows that PMETs are equally, if not more vulnerable to redundancies as rank and file workers," said labour MP Patrick Tay. 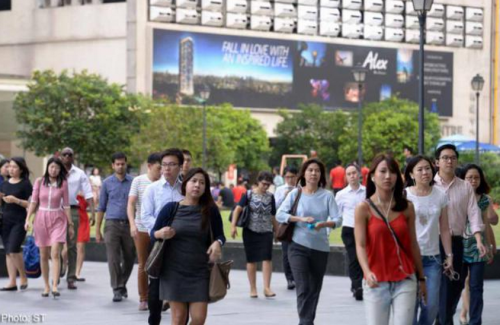 OCBC Bank economist Selena Ling noted that workers laid off from the professional services, information and communications and manufacturing industries - which employ a sizeable group of PMETs - tend to switch industries when securing a new job.